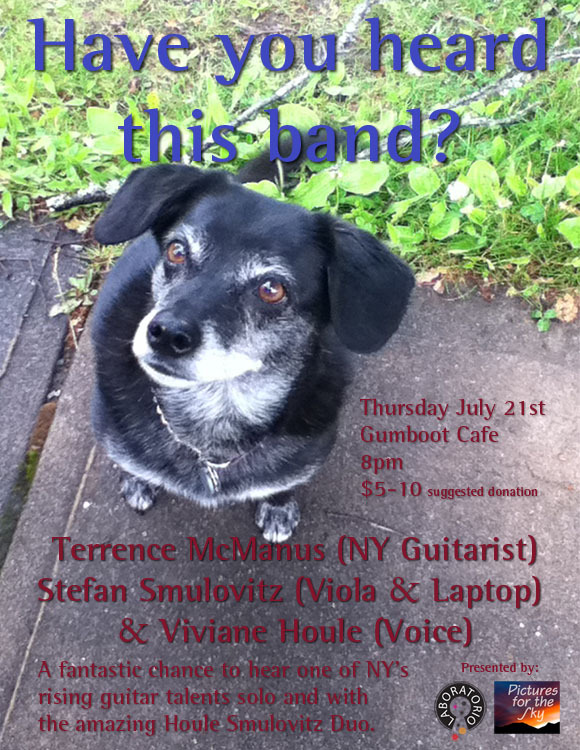 A fantastic chance to hear Terrence McManus, one of NY’s rising guitar talents solo and with Roberts Creekers Stefan Smulovitz (laptop/viola) and Viviane Houle (Voice). Born in Brooklyn, New York, guitarist Terrence McManus grew up in New Jersey and Connecticut. He has performed with John Zorn, Bill Frisell, Tim Berne, Ellery Eskelin, Herb Robertson, Mark Helias, Gerry Hemingway, Anthony Cox, Kermit Driscoll, Russ Lossing, Marty Ehrlich, Mat Maneri, Billy Mintz, Michael Sarin, and Gene Bertoncini. He has performed at Carnegie Hall, the New York Guitar Festival, Ellis Island, and the inaugural month at John Zorn’s The Stone. Terrence is currently a member of the Gerry Hemingway Quintet, the Kermit Driscoll Group, the Herb Robertson Ensemble, and the Hemingway/McManus Duo. His own projects include The Wealthy Industrialists, with Tim Berne, Herb Robertson, Mark Helias, and Gerry Hemingway; Transcendental Numbers, with Mark Helias, and Gerry Hemingway; and a chamber ensemble with Ellery Eskelin and Gerry Hemingway. The chamber ensemble recently premiered a new sixty minute, multi-sectional, through-composed work entitled. The piece has also been performed in an expanded quintet configuration, adding Russ Lossing and Mat Maneri, and in a solo guitar setting. An accomplished solo guitarist, Terrence performs his own compositions and arrangements, and has developed a unique style of improvisation, drawing on extended technique and prepared guitar. In 2009 he was invited to perform in the 5th annual Electro-Music Festival, and that same year did solo tour of California, with concerts in San Francisco, Berkeley, Monterey, and San Diego. In 2008 Terrence was featured in the book, State of the Axe: Guitar Masters in Photographs and Words, by legendary photographer Ralph Gibson. The book, published by Yale University Press, was produced in conjunction with The Museum of Fine Arts, in Houston, TX, where the book’s images were on exhibition.